Home » Product Reviews » 10 Best Flat Irons on the Market – Can I Make My Hair Perfectly Straight? My hair has always been frizzy. I was frustrated by this situation my whole life. When I was a teenager, I asked my mother to buy me my first flat iron. She wouldn’t hear about it. She was worried that I would either burn my hair or pull it all out and go bald. After a year of begging, I purchased my first flat iron, learned how to use it, and none of this happened. Since then, I tried various irons and changed my hairstyles numerous times. I even straightened my mother’s hair on a couple of occasions. I learned a lot from this experience. I have to admit, I was, too, afraid that I would damage my hair, so I read, tried, tested and at last chose carefully. Today, I will help you navigate your journey through the best flat irons on the market. I will tell you what to look for and present you the best models you can find. When you are purchasing a flat iron for yourself, you are juggling different concerns. Will it make my hair completely straight? How much is it going to damage my hair? Do I have to pay a fortune to get perfect hair with least possible damage? Choosing the best flat iron on the market is not an easy thing to do. However, it is much simpler when you know what to look for. I will list out the three most important factors you must have in mind while searching for the best flat iron. Also, I will explain each of them in detail, so you know what to go with. Usually, the general rule is this - the wider the plates, the faster you'll be able to style your precious hair. In this case, wide plates are the good thing. However, if you travel a lot and you have to bring your flat iron with you, narrower plates are a better idea. This way, it won’t take up too much space in your bag. I bet you’d like things to be that simple, but they never are. There is another thing you should consider before deciding on the width of your flat iron – the quality of your hair. You can see the instructions on how to choose the right plate width according to the type of your hair in the table below. If you have thin, fine, practically straight hair, you don’t have to worry. You can choose whichever width you like the most. However, keep in mind that wider means quicker, but narrower means more flexibility. If you are not a hair stylist or other hair professional, when you see the features of an average flat iron, you will be confused. Titanium? Ceramics? It does sound fancy, but tell me one thing – which one of these won’t burn my hair? · Titanium irons are the forefront in hair straightening technology. They heat up quickly and distribute higher temperatures more evenly which makes them the safest option for your hair. However, they are more suitable for curly, coarse hair. If your hair is delicate, it is better to stay away from titanium. · Ceramic irons offer great effectiveness, and they work excellent for most hair textures. They heat up pretty fast and stay hot as long as you need them to. There is no doubt; ceramic iron is a way to go. Unfortunately, there’s always a “but.” The market is full of ceramic coated flat irons. This means lower quality, as the ceramic coating wears down. Once the surface is damaged, you’ll end up with a flat iron that has hot spots, which will damage your hair. · Tourmaline coating is made out of a gemstone which is ground up and then spread over the ceramic plates. It ensures that the heat remains consistent and the necessary moisture remains trapped in your hair. For this reason, tourmaline plates are ideal for damaged hair. They can be used at lower heats and still provide excellent results. When choosing the right flat iron for themselves, people often rush to buy the ones that offer the highest heat options. It is true; high heat usually means faster, more effective straightening. However, not all hair types need such treatment. The optimal temperature to set your iron at is around 365°F. Still, this depends on the thickness and structure of your hair. People often lower the temperature for the sake of damage control, but this can be counter-effective, as you have to do more passes through your hair. Always go for the irons that offer adjustable heat settings. Ideally, the settings should be digital, but temperature knob or button can work just as well. Now that you know what to look for while purchasing flat irons, you are ready to see the best models on the market. I have so many friends who swear by The HSI Professional Glider that I just had to try it. It features ceramic and tourmaline crystal iron plates with 8 HeatBalance micro-sensors. You can adjust the temperature from 140-450°F which is more than most flat irons offer. Also, this glider is dual voltage compatible and comes with a swivel cord. As I said, many people use the HIS glider, so I had a chance to see how it works on different hair types. It will turn even the frizziest hair into beautiful silk. The unit heats up extremely fast, on both sides which is great if you want to make curls. Also, the setting dial is simple, and you will figure out how to use it within seconds. Most importantly, this flat iron comes with a 1-year warranty and a mini-pack of argan oil leave-in hair treatment which is a nice touch. However, you will notice that the plates lose heat quickly and the paddles might fail to grip your hair. Also, the handle becomes really hot, so make sure to use protective gloves. If you have extra long hair, the blades might be a bit short for you. Both sides of the iron heat up, which makes it perfect for curls. The setting dial is straightforward and easy to use. It is inexpensive, versatile and comes with various extras. It loses a significant amount of heat during straightening. Paddles are so smooth that they don’t grip your hair very well. The handle becomes hot as well. The blade might be a little short. Remington is a well-known name in the hair-styling industry. Their flat irons have dominated the market for years. If you are struggling with hair static and flyaways, this might be the right model for you. It has long, one-inch ceramic plates with titanium protection coating. The temperature is controlled digitally, and it can go up to 410°F. What I liked about this flat iron is how safe it seems. As I said, you can control the temperature digitally, and if you forget to turn it off, it will shut off automatically, after 20 minutes. Also, if you are always in a rush, you will love the fact that this flat iron heats up under thirty seconds. Its swivel cord is rather handy, especially if you are left-handed. However, if you want an iron that runs through your hair smoothly, you might want to skip this one. It will pull your hair which can be both painful and annoying. If you travel, you might have to use an adapter for it. Finally, its off button is placed right where your hand grips the handle, which means you might end up hitting it by mistake. You can digitally control the temperature. It heats up rather fast, under thirty seconds. It turns off automatically, after 20 minutes. It doesn’t leave a burning smell in your hair. The swivel cord is a fantastic feature. It won’t run smoothly through your hair. It doesn’t eliminate the frizzle completely. You might have to use an adapter. The off button is placed where you grip the handle so that you can press it by mistake. Are you a person who doesn’t have enough time to dry their hair properly let alone style it? If so, you will like Remington’s Wet2Straight flat iron, which does two things at once. With 1 3/4” ceramic and titanium plates and unique steam vents, it will remove water from your damp hair and style it within minutes. It offers thirty different heat settings, and you can set the temperature up to 420°F. This flat iron truly does cut down your styling time, and I adore it. It heats up within thirty seconds and reaches the highest temperatures under two minutes. It also has a handy wet/dry indicator which tells you which mode is on. With thirty different heat settings, you’ll have no problem finding the perfect temperature for your hair. Also, the price is more than reasonable. 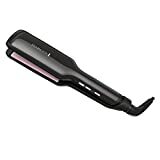 Remington Wet2Straight flat iron auto shuts off after one hour, which seems too long to be safe, especially when you know that the blades cool off much slower than in other models. Your hair might get stuck in the frame and cause you pain. 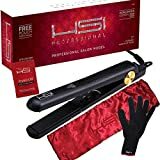 At last being wider than other models, this flat iron might not work for you if you have short hair and it won’t perform very well on your roots. It offers a lot of different heat settings. It works on wet hair. It will cut down your styling time without any doubt. It heats up to the highest setting in less than two minutes. It is more than reasonably priced. It cools off really slowly. It might be too wide for short hair. Your hair might get caught in the frame and pulled out. It doesn’t straighten the roots very well. I am not done with Remington irons yet! Their Pro flat iron features incredible pearl ceramic technology, which means its two-inch plates are pearl infused to offer smoother glide. You can increase the temperature up to 450°F which is rare among this manufacturer’s models. It heats up in 15 seconds and comes with a 2-year limited warranty. Two-inch paddles might be too wide for some, but for people with coarse and extra-long hair, they are ideal. What I really liked about this flat iron is how much protection it offers and how handy it is. The swivel cord is fabulous, it is lightweight, and a lock-up button helps you store it away quickly. This flat iron is fast, efficient, affordable and does significantly less damage. On the other hand, it is not quite ergonomic. The blades get extremely hot, so watch your face, neck, ears and your fingers. Also, you’ll keep pushing the off button while you use it, which is inconvenient. As your iron heats up, a weird smell might appear and the pink button on the inside might start to brown after a few uses. Therefore, I don’t think this is the sturdiest, the most reliable product on the market. The swivel cord is fabulous, especially for left-handed people. The wide paddles are ideal for long hair. There is a lock-up button, which makes it easy to store away. Ceramic plates will do significantly less damage to your hair. The blades get extremely hot so that you might burn yourself. It has a weird smell while it’s heating up. Your hair might start to frizz after a few hours. The pink button on the inside might start browning after a few uses. 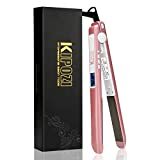 If you are looking for a flat iron with genuinely ergonomic design, Kipozi’s Pro flat iron might interest you. It is dual voltage compatible and comes with eight feet long swivel cord. 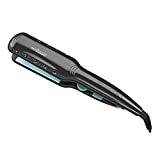 At the same time, it features one-inch titanium plates with PTC ceramic heater and far-infrared technology which will help you get rid of the frizzle. You can set the temperature to 270-450°F. In comparison to other models, I really liked how convenient Kipozi’s iron was. You can use it anywhere you want and adjust the temperature easily. These ceramic plates will glide through your hair without pulling and make it perfectly straight. Also, I have to admit; the pink color is adorable. However, I don’t think this is the safest thing to use. It has a 90-minute auto shut-off option, which is too long if you ask me and it takes a while to cool down. Also, the plates get a crackly look after one or two uses which is a bit suspicious. Make sure to wear protective gloves! It has a very long cord and ergonomic design. Adjusting the temperature is super easy. The ceramic glides through hair smoothly and leaves it perfectly straight. It is dual voltage, which means you can use it all around the world. It looks like a high-end flat iron. The plates might get a crackly look after the first use. It takes a while to cool down. You’ll need to turn it on manually every time you plug it in. The surface gets very hot, so you’ll have to use protective gloves. There are a few things I’d like you to remember. No flat iron is perfect. However, at least few of them are suitable for your hair, and you will find them on this list. Make a wise choice and consider your hair type above everything else. Price, brand, design - none of these things matters, your hair is what’s important. If you want to keep it healthy and beautiful yet stylish at the same time, you have to consider its nature. Don’t forget – plate width, material and temperature settings are the factors that will decide whether you are dealing with high-quality flat iron or not. My choice is always a good old reliable ceramic one-inch iron with digital temperature settings and swivel cord. Now, go ahead, straighten or curl up your hair and use heat protection products!